Don’t fight it! If grass dies under your trees, let go and plant something else. 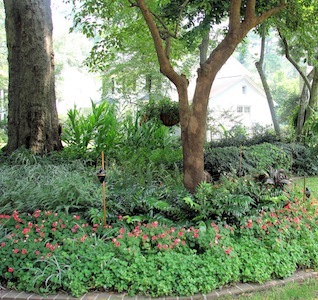 Think outside the boxy lawn, and add beauty and easy maintenance with groundcovers that prefer shady growing conditions. Also, don’t be caught up in the idea that a groundcover has to mimic grass. It does not. Drive around your city and take note of what gardens catch your eye. 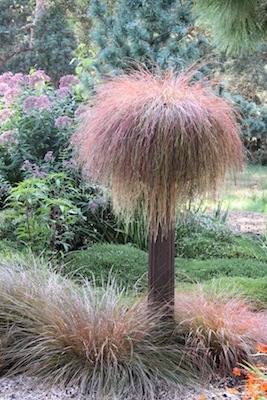 Usually, they will be the gardens with curvaceous grassy areas, edges crisp and sharp, running up to beds under trees that contain several different heights and textures. Does this look beautiful in summer and winter? Yes. Is it hard to maintain? No. Is it easy to install? That depends. First, if your tree limbs hang low, cut off the lower branches. Called “limbing up,” this pruning allows more light, air, and rain into the area above the tree roots. Fall and winter, while the trees are dormant, is the perfect time to assess and shape up your trees. Now you can get the beds ready underneath. The weeds and skimpy grass have to be removed from the bed area. The lazy way is to cover the area with several thicknesses of newspaper, up to eight sheets deep depending on the thickness of the stuff you want to kill. Once the paper is in place, water it well to settle it and keep it from blowing around. Then cover it with 2-3 inches of mulch. The paper will bios-degrade and help to enrich the soil. In the meantime, it and the mulch, will keep weeds from getting into the bed. 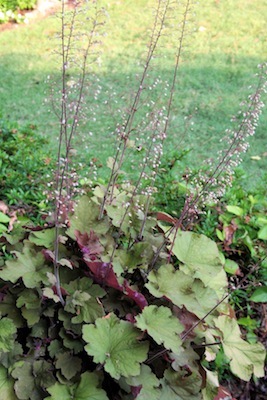 In six to eight months or even a year, you should be able to plug your groundcover plants through the mulch and paper. To make it easier to plant small plants, use a long bulb auger on the end of a portable electric drill to make dozens of planting holes in no time. Remember, it is just as easy to maintain a variety as it is to maintain one. Easier, even. Monocultures are decidedly risky, just because every plant in the bed is threatened if a disease or insect were to attack it. In a varied planting, the many could take over for the few, and your planting would still look good. Ivy isn’t the only thing that will grow in shade. Here are some groundcover ideas. A plus, they will not climb the tree they grow under, as ivy does. There are many woodland plants that will grow in the shade under trees; but many of them will disappear during the heat of summer, like Jack-in-the-Pulpit and Mayapple, only to reappear the following spring. 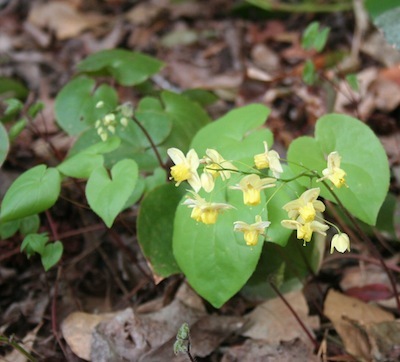 You can use them along a woodsy trail in the shade but you should not depend on them as groundcovers. Do be responsible and check on any natives or non-natives that might be considered a pest in your state. Enter “invasive species” and your state name into your favorite search engine to find a list. Check it against the list you wish to plant. 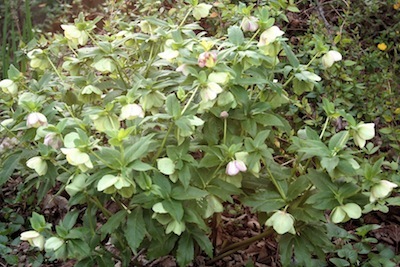 In some states, periwinkle and sedge are problem plants. In others, they are well-behaved garden visitors. Don’t be afraid of the shade. It is kind to plants and to the gardener, especially in July and August.